I started fishing at a very young age in Bonita Springs FL. My first boat was a 14 ft Sears Game Fisher with a 10 hp Mercury outboard. Whether it was the middle of the summer or the dead of winter I was out fishing every day for Snook, Redfish, Tarpon, and Trout. When I turned 18 and it was time to find a career I had a couple of uncles and cousins who were professional fishing guides in the fl keys. It wasn’t a hard desision for me to get my Coast Guard Captains license and follow in their footsteps. I bought my first flats skiff back when there weren’t to many boat companies to chose from. A few brands names were Dolphin , Willy Roberts, Hewes and Maverick. I chose to buy a brand new Maverick. In fact, after 30 years of guiding I am still fishing out of a Maverick, they are truly the best flats boat on the market today. The area I initially selected to guide from was the 10.000 Islands, setting up my service at The Port Of The Islands Marina. As I continued to build my clientele, I moved my business to to a more remote location, Everglades City, where I now fish out of a marina called Glades Haven. That’s where I met and became good friends with guides like Snapper Butler, Denny Noble, and Glenn Smallwood. They knew everything about Everglades fishing, and were the true pioneers of the guiding business. They remain legends to this day! Everglades National park to me is without a doubt the best place in Florida to guide from. 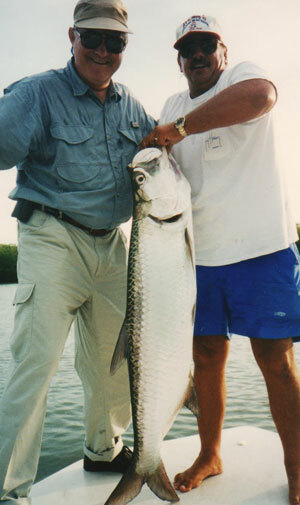 In any given day my clients are exposed to fishing opportunities that many anglers only dream about. I’ve never tired of meeting new people and chasing Snook, Redfish, Tarpon and Trout around the shallow flats and Mangrove islands. Becoming a fishing guide was one of my best decisions… I wouldn’t trade my job for any other.